I love this photo...I've printed out a copy and stuck it on my wall because it's so inspiring! For more sewing club tales you can visit Clare and her blog here. sarah said...oh this is so lovely! thanks for all the hard work you have done!!! chrissie said...If I were lucky enough to win, I would love the Pastels pack... gorgeous, gorgeous, gorgeous! Louise B said...Filled my wish list up. So many lovely colours, didn't want to stop. Thanks for the chance to win. phew-ee, what a long list! I shall start to email you all now...CONGRATULATIONS everyone! It's the last day of my Freebie Extravaganza .....here's the deal: every day I will blog about a different new item or range in detail...if you like it and would like to win it, you leave a comment on that blog post...and on Bank Holiday Monday (27th August 2012) I will draw all the winners. 9 days , 9 chances to be a winner....and you can enter all 9 freebies if you like! It's the final day of the Freebie Extravaganza! And what kind of an extravaganza would it be if it didn't end with a bang? I hope you think this is a good ending!! Anything and everything that's for sale can be added to your website wish list so shop, shop, shop!!! Come back to this blog post and leave me a comment telling me you've done it, if your name is picked your wish list will be yours! Today's freebie gives the chance to win your website wish list! The Freebie Extravaganza is under way.....here's the deal: every day I will blog about a different new item or range in detail...if you like it and would like to win it, you leave a comment on that blog post...and on Bank Holiday Monday (27th August 2012) I will draw all the winners. Alongside my new Mini Kits I have also designed two new Large Boxed Kits....and both of them make a different Garland Decoration, hooray! The Star Garland Kit makes a Garland with 6 stars (there are 3 different sized stars). The stars are decorated with bright Christmas Coloured patchwork-inspired diamonds and finished with Big Bright Buttons. Last Year I saw a lot of finished Christmas Tree Garlands and I hope to see a lot of these garlands finished too, I love how each finished Garland is different to the next, and can't wait to see the end results! Today's freebie gives the chance to win a large Christmas Garland Kit! It's time for a hand made prize! I often get asked if I sell the items that are in my kits ready-made....and the answer is Yes! I do! So this is a freebie for ready made fans....simply choose which decoration you'd like and if your name is picked that's the decoration you'd win...and if you can't decide I'll send you a surprise! 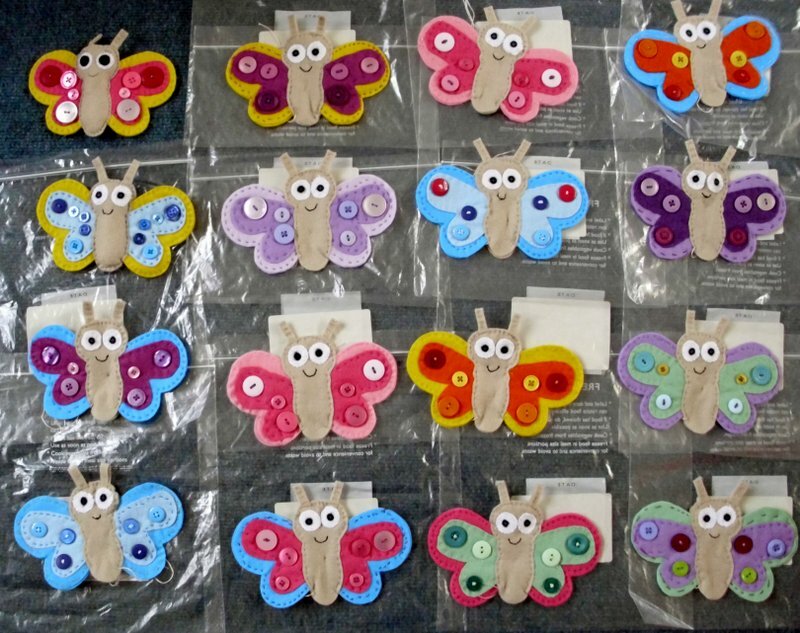 Today's freebie gives the chance to win a ready made Christmas Decoration! On to today...the most useful freebie of all :: Swatch In A Box! Today's freebie gives the chance to win a Swatch In A Box! Today it's Christmas Mini Kits (part 2)...thanks for all the lovely comments yesterday, I'm glad you like the new kits! It's fun to find out which your favourites are....at the last count there were 88 comments split as 35 Christmas Trees, 23 Penguins, 16 Gingerbread Men and 11 Reindeer....and I thought Gingerbead Man would be the favourite!...I wonder which of these last four will be the favourite?? Today's freebie gives the chance to win a Mini Christmas Kit of your choice! Working on projects (like the new felt) and designing new things (like the new kits) and not being able to share them for months and months is torture....but being able to share them all in one week is so fantastic that's it's nearly worth enduring the waiting... I still have so many new things to share that it's hard to pick which ones for each day! ....or the ever popular happy Reindeer. I added them to my shops over the weekend and quite a few of these cuties are already on their way to new homes...and now 4 more are looking for new homes .... leave a comment to say which kit you would love to win (Christmas Tree, Penguin, Gingerbread Man or Reindeer) and if your name is picked that's the prize you'll receive! The other day I gave you a sneak preview of my new Loyalty Card and today I am showing you the Free Craft Kit that you receive once you have filled your Loyalty Card (I won't go into all the details of how it works on the blog, but if you want to find out more you can on the website). 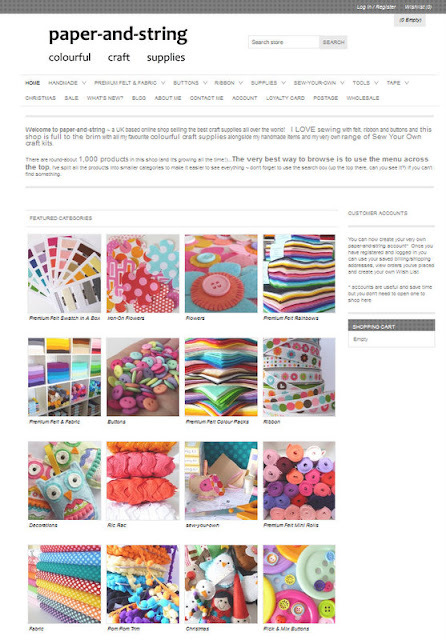 The colours vary with every pack, and I for one love the brightness and variety in the New and Improved Free Craft Kit....and I hope you do too! Today's freebie gives the chance to win a Loyalty Card Kit, without having to wait to fill your card up! Today's freebie is for my new size of Felt Rainbow....a 6" rainbow. ...and all of them have new packaging! A polka dot cardboard band with all the necessary info AND a removable mini postcard to finish it off. I have spent most of this morning re-opening and filling my etsy/ebay & folksy shops with the new felt rainbows...they have always been best-sellers, here's hoping the new size will be too! My New Felt Project is finished! ....this, my lovely customers, is my new range of felt! Just look at those colours!! And after 11 months of searching, planning, having meetings and sending a billion emails I finally found it! This is Premium Wool Blend Felt. It is 40% wool & 60% Viscose....Not only has it got 10% more wool than my original felt, it's also softer, stronger and MUCH better quality. It's still a natural product and there will always be slight differences in weight per colour BUT Premium Wool Blend Felt is much more consistent, and the colours...they are amazing!...and the best bit? The prices have stayed exactly the same! Better Felt & Better Colours all for the exact same price....can you tell why I'm so excited! 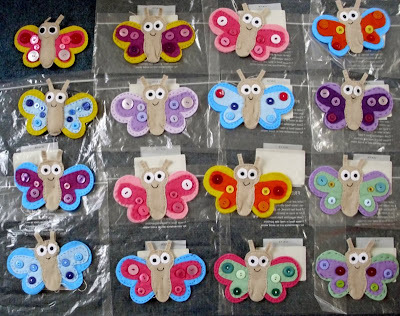 The manufacturer is dyeing my felt to order .... it took me FoReVeR to finalise my 45 colours....some of the original colours have been bid a fond farewell....some have been reproduced because I love them, and there are NEW colours too! the rainbows are all cut and stacked ...and now come in 4 sizes: 4", 6", 9" and 12"
Yay! The Fantastic New Felt has Landed!! oh and the original felt? that's all been popped in the sale section with 10% off, and once it's gone it is gone for good! In other paper-and-string news I have also added all my new Christmas Mini Kits to the website, updated the free craft kit & loyalty card offering AND added two new BIG Christmas kits too! The Freebie Extravaganza starts today.....here's the deal: every day I shall blog about a different new item/range in detail...if you like it and would like to win it, you leave a comment on that blog post...and on Bank Holiday Monday (27th August 2012) I will draw all the winners. 9 days , 9 chances to be a winner.... you can enter all 9 freebies if you like! Today's freebie is for a set of 5 Mini Rolls.....To enter leave a comment and list your favourite 5 colours in your comment, and if your comment is the winning comment that's the colours you will receive! It's a weird feeling to know that all my online shops are closed! shut my Wholesale Shop...but don't panic, it's only temporary so I can keep check on things. oh, and I've planned a freebie extravaganza, you'll want to keep coming back for that, it's going to be good AmAzInG!!! from the very beginning of paper-and-string I have designed, printed, cut & folded all my own packaging...but all that had to change when I designed the first kits for John Lewis...either that or I'd have to buy a lot of printers & a LOT of ink (which is much-o expensive) It's a terrifying step to take because anything that's slightly different to standard sizes needs to be ordered in big numbers to get them to be cost effective, and that plays havoc with the cash flow! For my New Felt Project I needed some non-standard sized packaging, so my sister got cracking (again, thanks lovely sister!) with the designing, and I got cracking with the money shuffling and hey presto! Stage one of the New Felt Project packaging is here...the second lot is coming from a different printer and should be here tomorrow, fingers crossed! I've been working on a new felt project. Plonked myself on the sofa and watched and worked** and cried and cheered. * I also spent time wondering why we were introduced to Prince HENRY at the closing ceremony, I had imbibed some celebratory wine and wondered if I was going loopy. Good Old Wikipedia helped me out, and taught me something new! 600 little bags with pom poms and things in for a new kit. 1500 pieces of ribbon measured and cut for other kits!